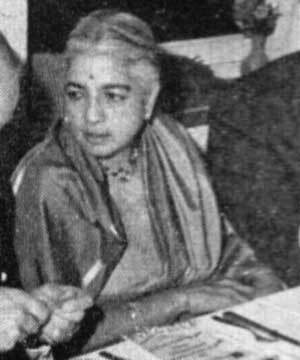 Mrs Rukmini Devi Arundale was a Vice President of IVU for 31 years from the World Congress in Paris, 1955, until her death in 1986. The normal practice during that time was for each member society to elect a Vice President, though they could also be elected by IVU to represent a country. Mrs Arundale may have represented the Bombay Humanitarian League or India as a whole, it is not clear from the records. During her time with IVU Mrs Arundale was a significant figure in her own right, but in order to understand her earlier life we have to know about her husband, such was the role of women in the first half of the 20th century. The following is based on information from The Life and Death of Krishnamurti by Mary Lutyens, 1990. The first we know of George Arundale was that at the age of 32, in 1910, he was the Principle of the Central Hindu College at Benares. He was also a prominent member of the Theosophical Society under the President Mrs Annie Besant, and the Society had identified a boy, Jeddu Krishnamurti, as 'the coming world teacher'. Krishnamurti selected George Arundale as one of a small group, initially for him to teach the older men, though Arundale later became the teacher in a more conventional sense. This statement seems very strange in view of the fact that Mary Lutyens was herself a life vegetarian, and could hardly have thought that eggs were essential to avoid starvation... - 'Lady Emily' was her mother and another theosophist (and the wife of the architect Sir Edwin Lutyens). It is also odd as Rukmini was reported to be a Brahmin, the most strict of Hindu vegetarians who would not normally have eaten eggs anyway. 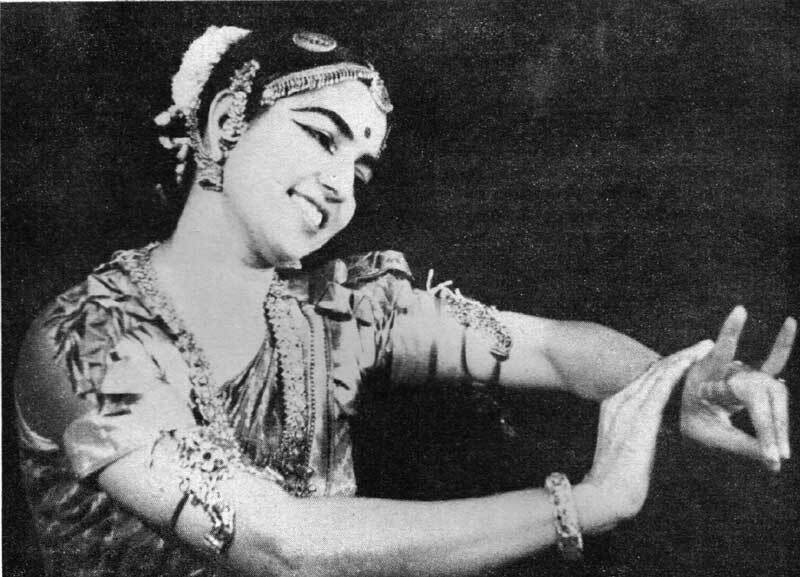 Over the next few years Rukmini accompanied George on his world travels giving lectures - and apparently establishing herself as a traditional dancer (see right, click on the photo for a bigger version). In 1933 Annie Besant died and George Aundale became the TS president until his death in 1945. We have no further details but presumably Rukmini continued to support him in this role, she would have been only 39 when he died. We don't currently know much about Rukmini's activities over the next few years but she clearly established her own career in Indian politics and the TS. Our first mention in the IVU records is at the World Vegetarian Congress in Paris, 1955: "The following additional Vice Presidents were elected:- ... Mr.J.N.Mankar (India); Mrs Nehna Vakil (India); Mrs Rukmini Devi Arundale (India); Mr Magenlal Shah (India) ... " As far as we know these were the first people from India to have any official role in IVU. The influx must have been connected with the Bombay Humanitarian League which became a member of IVU at the same Congress, following a special vote to admit 'humanitarian' as well as vegetarian societies, provided thay were entirely governed by vegetarians. The 1957 World Vegetarian Congress was held in India, the first ever outside of Europe, and was mainly organised by Jay Mankar. The minutes record: "Mr.J.N.Mankar gave thanks to the president and all the delegates who had taken part in the Congress. He also gave special thanks to Mrs.Rukmini Devi Arundale who had inspired and guided the reception committee, and to the many generous Indian hosts and hostesses." Mrs Arundale at the IVU Congress in Germany 1960, where she was elected chair of the Congress. - text of a talk at the 1960 Congress. Between that Congress and the next one in Germany, 1960, the IVU President, Deputy President and General Secretary had all died (which says something about the age of the officials in those days...). The minutes record: "In the absence of a President and Deputy President Mrs Rukmini Devi Arundale MP (India), IVU Vice President, was elected Chairman for the Congress. " She does not appear to have stood for election on a permanent basis in IVU, remaining as a Vice President, but by this time she had become a Member of Parliament in India. Over the next few years more societies in India joined IVU, including: Indian Vegetarian Congress, Bombay Vegetarian Society, All India Animal Welfare Association, Vegetarian Club of Delhi, North India Vegetarian Union, Vegetarian Society (Reverence for Life), India and probably more that are not recorded in detail. The IVU General Secretary's report from the 1977 Congress, in India mentions: "My wife and I and a few other foreign representatives were lucky enough to reach New Delhi in time to attend the closing session of the 3rd, National (All-India) Conference on Animal Welfare. 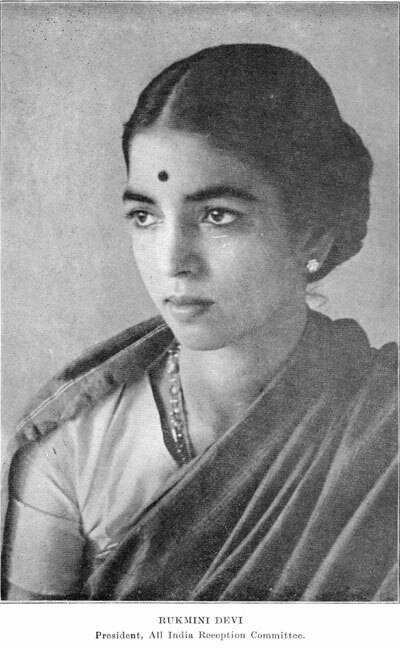 Mrs Rukmini Devi Arundale (I.V.U. - V.P.) was in the Chair "
In 1980 Mrs Arundale stood for election as President of the Theosophical Society, 35 years after her huband's death whilst in that office. She was defeated in the election by her niece. At the 1982 IVU Congress, in Germany, Mrs Arundale was elected as a Fellow of IVU and at the next Congress, Baltimore, USA, in 1984, she was given the Mankar Memorial award for her services to IVU. The minutes of the 1986 Congress record: " It was with great regret that the passing of Mrs Rukmini Devi Arundale occurred earlier in the year. This greatly loved Indian lady had served the Vegetarian Movement for many years. She was an Honorary fellow of both the IVU and the VSUK. Two years ago, she was awarded the Mankar Memorial Trophy in recognition of her 'most outstanding contribution for the furtherance of the organisation'. " At the previous meeting of the IVU Council she had been described as 'a prominent Indian politician'.